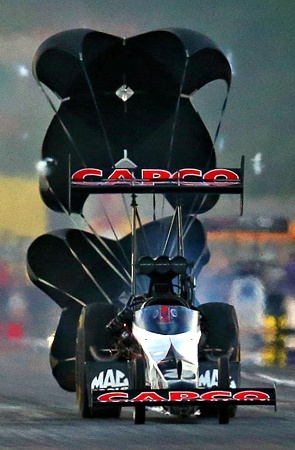 June 8, 2016 -- Coming off a runner-up finish just four days ago at Epping, N.H., Steve Torrence tries to maintain momentum this week at the controls of a Capco Contractors/Rio Ammunition Top Fuel dragster that has had an all-or-nothing history at Old Bridge Township Raceway Park, site of the 47th annual NHRA Summernationals which begins with a pair of qualifying sessions on Friday. The 33-year-old Texan, whose teenage battle with Hodgkins lymphoma was documented in a recent article by publisher Bobby Bennett on CompetitionPlus.com, won the Summernationals in impressive fashion in 2012, besting Bob Vandergriff Jr., Tony Schumacher, Spencer Massey and, finally, Brandon Bernstein in a classic 3.800-3.807 second final round. Other than that, though, the former NHRA Top Alcohol Dragster World Champion (2005) is 0-for-his-career at Raceway Park: four first round losses in four other appearances. Nevertheless, past performance no longer is of any consequence to the driver and team owner who already has demonstrated this season that he will be a major player in the battle for the $500,000 Mello Yello bonus to be decided in the six-race Countdown to the Championship. Through the season’s first nine races, Torrence and a team anchored by crew chief Richard Hogan, tuning consultant Alan Johnson and car chief and New York native Bobby Lagana, son of the late Bobby Lagana Sr., a fan favorite at Raceway Park, has delivered on those expectations. In either qualifying or eliminations, Torrence has hit the pedal 56 times this year and gone to the finish, under power, on all but four attempts. That’s 52 runs quicker than 3.900; 37 quicker than 3.800. As a result, Torrence’s confidence has grown with each event. Winner of the season-opening Circle K Winternationals at Pomona, Calif., and of five other Top Fuel events in his brief career, Torrence presently is third in Mello Yello Championship points behind only veteran Doug Kalitta and reigning series champ Antron Brown, to whom he lost in a rare Monday final in a New England Nationals event extended by rain.